This week, for the Divisional Round of the playoffs, we’ll be looking at each positional grouping at each team and examining their DFS value and fantasy football upside on both DraftKings and FanDuel. Below is the look at the quarterback position. On a typical full-game slate, I want to feel comfortable with every player I’m rostering. Ideally, even my punt-plays are tremendous values with high-upside. On a shorter slate like this (four games, eight teams) it’s okay to roster a relatively “gross” name if you feel they give you a stronger lineup overall – allowing you to pay up elsewhere. I can’t stress enough the importance of late-swap on these smaller slates. If you have any tournament lineups that, after a bad game or two, seem unlikely to cash, you have nothing to lose and everything to gain by adding exposure to some “riskier” lower-owned players. Notes: All numbers in parentheses refer to a player’s salary rank on each site. Matchups (general): On paper, Luck has the softest matchup. The Chiefs rank worst of all 32 NFL teams in schedule-adjusted fantasy points per game allowed to opposing quarterbacks. As defenses, the Saints, Patriots, Colts, Rams, and Eagles rank between 10th- and 15th-worst. The Chargers rank seventh-best and the Cowboys rank 10th-best. … In opposing passer rating, the Saints rank worst on the slate (seventh-worst overall) followed by Dallas (10th-worst), but all other defenses rank average or better. The Patriots (seventh-best) and Chargers (ninth-best) both rank top-10 by opposing passer rating. … In fantasy points allowed per dropback, the Saints rank seventh-worst, while all other defenses rank outside of the bottom-12. The Chargers rank fifth-best by this stat, while all other teams rank somewhere outside of the top-10. Matchups (pass rush): The Rams have had the league’s best pass rush this year, pressuring the opposing quarterback on 40% of their dropbacks. That’s bad news for Dallas, who ranks worst on the slate and ninth-worst overall in pressures allowed per dropback. The Eagles have had the league’s second-best pass rush by this same stat, but New Orleans has ranked third-best in pressures allowed per dropback. The Patriots are a tougher matchup for the Chargers, who rank 12th-worst in pressures allowed per dropback. New England’s defense ranks ninth-best in pressures forced per dropback. Patrick Mahomes has been the league’s most pressure-sensitive quarterback this year, but Indianapolis ranks worst on the slate and ninth-worst overall in pressured forced per dropback. Matchups (funnel): The Saints have had the league’s top “pass funnel” defense this year, giving up 77% of their total yardage via the pass. That’s partly a function of their high-powered offense forcing the opposition to try to play catchup, but it is also due to the strengths and weaknesses of their roster. They rank second-best in yards allowed per carry but seventh-worst in opposing passer rating. The Eagles are also a top pass funnel defense, surrendering 74% of their yardage via the pass (third-most), as are the Cowboys at 71% (fifth-most). The Rams are the closest thing on this slate to a run funnel defense (and especially in contrast to what’s expected given gamescript). 34% of their yardage allowed has come via the run (ninth-most). They’re average in opposing passer rating, but fourth-worst in yards allowed per carry. This has been a common theme of Wade Phillips’ defenses, and Dallas has been the league’s 10th-most run-heavy offense this year, so that’s fine by them. They’ll run the offense through Ezekiel Elliott until Los Angeles’ lead is starting to look insurmountable. Matchup (home v. away): First off, quarterbacks who are home and favored tend to perform much better for fantasy. Secondly, home/away splits tend to matter much more for some quarterbacks than others. Arrowhead Stadium gets a lot of credit for being one of the noisiest stadiums in the NFL, and I’d bet that has played a significant role in Kansas City’s glaring home/road splits. Among all defenses, the Chiefs have given up the second-most points per game on the road, but the sixth-fewest points per game at home. As a result (less pressure on the offense to score points), the Chiefs have scored 47 more points on the road than at home this year (most among all 32 teams). New England has similarly wild splits. They’re giving up the second-fewest points per game at home this year, but rank average on the road. Unlike the Chiefs, however, their offense has also been much better at home. They’re averaging 5.6 more points per game at home than on the road (most). The rank third-best in points per game at home (behind the Rams and the Saints) but 13th-worst in points per game on the road. The defenses for the Rams and the Saints are also deserving of a mention here. The Rams’ defense has given up 4.2 more points per game at home than on the road this year (most), and the Saints are right behind them, giving up 3.6 more points per game at home (this has long been a theme with the Supereome). tl;dr: Mahomes is worth paying up for if you can afford it. After that, there are four quarterbacks neck-and-neck in the tier below. How I’ll be deciding between them depends on site pricing, game theory, and who makes the most sense given stacking options. In 2018, Mahomes averaged 28.8 DraftKings fantasy points per game and 26.8 FanDuel fantasy points per game. Not only was that best in the league or best on the slate (by 6.2 and 5.6), but it was best by any quarterback all-time. By my data, this was despite having the toughest strength of schedule of any fantasy quarterback. 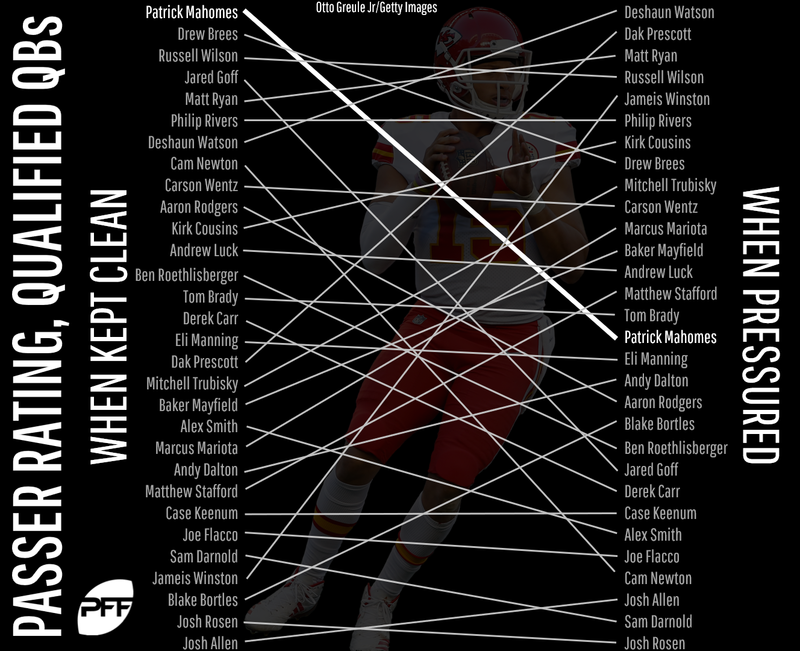 If Mahomes has any weakness, it’s that he hasn’t been as amazing when in the face of pressure. He leads the league in clean pocket passer rating (134.2) but ranks only 16th of 30 quarterbacks in passer rating when under pressure (70.4). Luckily for him, Indianapolis has struggled all year to generate pressure, ranking ninth-worst in pressures forced per dorpback. He’s the highest-priced quarterback on both sites: $7,000 on DraftKings and $9,000 on FanDuel. Still, given his record-breaking production, he’s cheap historically. Last year there were 55 instances of a quarterback being priced at $7,000 or more on DraftKings during the regular season. There were 16 instances of a quarterback being priced at $9,000 or more on FanDuel last year. There’s massive scoring potential for both offenses in this game, and Luck arguably has the softest matchup of any quarterback on this slate. The Chiefs rank worst of all 32 teams in schedule-adjusted fantasy points allowed per game. Luck has also been the second-most productive quarterback on this slate. That being said, Kansas City has only given up 14.3 fantasy points per game to opposing quarterbacks at home, which ranks eighth-best. He’s a fine play, but I suspect I’ll be lower-owned on him than the rest of the field, given how close he is in price to Mahomes. 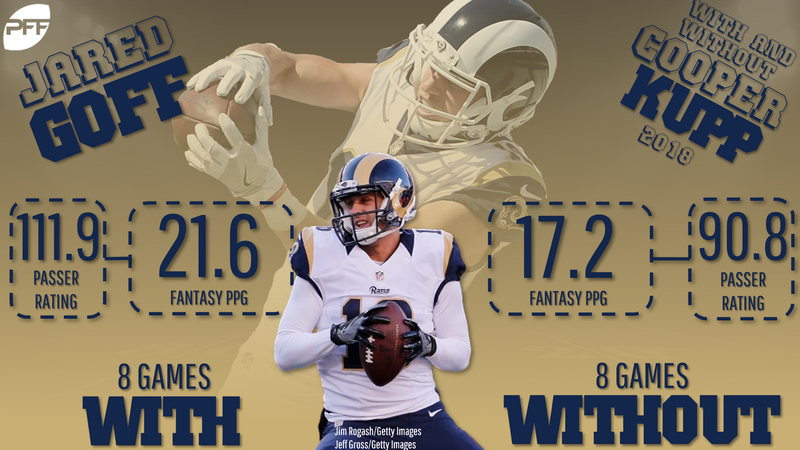 Goff ranks ninth among all quarterbacks and fourth among all quarterbacks on the slate in fantasy points per game (19.4). He’s been far more productive at home than on the road over the past two seasons, which should be good news this week. Over that span, he averages 21.0 fantasy points per game at home, but only 15.7 fantasy points per game on the road. His passer rating has also been drastically better at home (116.7) than on the road (82.7). Like Mahomes, he’s been extremely pressure-sensitive this season. He ranks 28th of 38 quarterbacks in passer rating when under pressure (59.8) but ranks fourth-best from a clean pocket (117.1). That too, I suppose is good news, as Dallas ranks 14th-worst in pressures forced per dropback. Still, Dallas has been strong overall, and Goff’s more recent statistics are particularly alarming. Since Week 12, he ranks third-worst of 26 qualifying quarterbacks in fantasy points per game (11.9) and third-worst in passer rating (74.8). Perhaps this is a function of the tougher defenses he’s faced over this span, or maybe it has to do with the loss of Cooper Kupp. I’m not sure, but I do find it concerning enough to avoid him entirely on FanDuel. I’m much more inclined to play him on DraftKings (only $100 more than Nick Foles), and he makes sense as a contrarian play on lineups without Todd Gurley. Prescott ranks fifth-best among all quarterbacks (and second-highest of the slate) in fantasy points per game since Week 6 and until the end of the regular season (21.4). He also hit value again last week (20.9 fantasy points). On paper, Los Angeles is somewhere between a neutral and above-average matchup for opposing quarterbacks. Still, Dallas is tied for the lowest implied point total on the slate and I’m expecting the team to lean run-heavy for as long as they can. The team also just lost Allen Hurns and has Cole Beasley listed as questionable. That said, he’s my preferred option on DraftKings (when paying down) as the cheapest option on the slate and only $1,200 more than minimum price. Oh, how the mighty have fallen (off of the age cliff?). Brady ranks second-worst on the slate and only 18th-best overall in fantasy points per game (17.5). Still, our grades think he’s been better than his fantasy production implies – he’s our fifth-highest-graded quarterback this year. He’s also been a bit better at home this year (by 2.6 fantasy points per game), but this matchup is the toughest on the slate. He’s cheap enough to look like a value, but it feels like a trap to me. 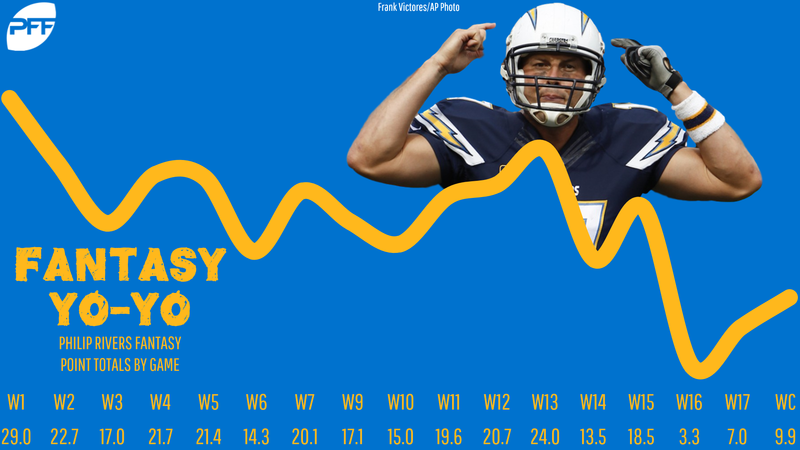 Rivers ranks ahead of Brady (17.8) but still just 20th overall in DraftKings and FanDuel fantasy points per game. In his defense, like Mahomes, he’s also had an exceptionally tough strength of schedule (third-toughest). This week, it looks a bit softer. New England ranks 11th-worst in schedule-adjusted fantasy points per game allowed to opposing quarterbacks (third-worst on the slate), though, like I pointed out earlier, they have been a good deal better at home. They’ve given up just 14.1 fantasy points per game to opposing quarterbacks at home, and against names like Mahomes, Luck, Aaron Rodgers, Deshaun Watson, and Kirk Cousins. That’s enough to keep me off him entirely on DraftKings, but as the lowest-priced option on FanDuel, he deserves consideration there. Brees dropped 30.5 fantasy points on Philadelphia when he played them in Week 11. Behind only Ben Roethlisbeger, Brees has some of the most glaring home/away splits I’ve ever seen from a fantasy quarterback, and that’s been true again this year. His passer rating at home (133.3) was by far the best of any quarterback this year, and far better than his road passer rating (99.3). He ranks third on the slate and eighth-overall in fantasy points per game (20.3). Though he only put up low-end QB1 fantasy numbers this season, he’s been just as good as ever, ranking as our highest-graded quarterback. His issue has been low volume; he ranks third in fantasy points per dropback, but 28th in dropbacks per game. If Philadelphia can make this a game, Brees could be the best option on the slate. However, that seems unlikely, with New Orleans favored by 8.0. On both sites, each time I select Brees, I have a hard time talking myself out of trying to move up to Mahomes. Mahomes is a slightly less heavy favorite (5.5 points), but the Chiefs are the third-most pass-heavy team when leading by a touchdown or more (56%), while the Saints are only the 28th-most pass-heavy team in the same situations (42%). The Eagles have greatly struggled against the run in recent weeks but are still more of a pass-funnel defense when looking at their numbers across the full season. He’s rightfully the second-most-expensive quarterback on both sites, but still feels behind Mahomes by a good margin. Even so, the Saints have the second-highest implied point total of the week, has slate-busting upside, and warrants above average exposure.